Ever since plastics were first processed into telephones, light switches and radio housings a century ago, their diversity and presence in everyday life have increased enormously. Synonymous with innovation, safety, comfort and virtually unlimited scope in applications and design, polymeric materials have meanwhile conquered all spheres of life. Without plastics and rubber, it will not be possible to master the huge challenges of the future. They are a byword for resource-conserving technologies, progressive mobility, the protection of food and drinking water, innovative medical technology, energy efficiency and sustainability. During K 2016 in Düsseldorf from 19 to 26 October, the special show “Plastics shape the future” will highlight the developments that are already taking shape and the visions that may become reality tomorrow. With reference to examples, the show demonstrates to what extent plastics are making their mark on modern living spaces – functionally, aesthetically and sustainably. Attention is also devoted to economic and environmental matters, and even problematical issues like marine litter, for example, will be addressed. Multimedia presentations and innovative stand design will enliven the programme of the special show in Hall 6, consisting of information and entertainment blocks, activities, keynote talks and rounds of discussions. Ideas from school pupils and students on how to shape the future will not only be the focus of the traditional Youth Day on the Sunday of K 2016 (23 October), but will provide fresh stimulus every day of the fair. “Plastics shape the future” promises telling insights and perspectives on the future for exhibitors and trade visitors to K 2016 as well as for the media and the general public. In 2016, the special show, a project of the German plastics industry under the leadership of PlasticsEurope Deutschland e.V. and Messe Düsseldorf, is supplementing K’s exhibition array for the 9th time. The world’s foremost gathering of the plastics and rubber sector will again be covering everything the industry has to offer. Some 3,000 exhibitors from all continents will be taking part, and all 19 halls of Düsseldorf’s fairgrounds are already fully booked. 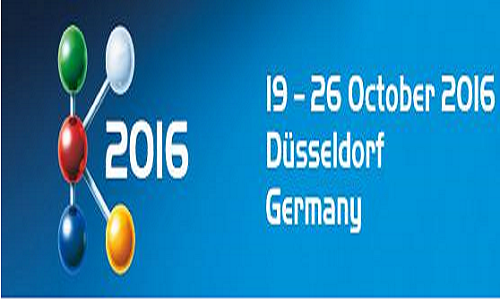 Some 200,000 trade visitors from all over the world are expected at K 2016. K 2016 is open daily from 10 am to 6.30 pm from Wednesday, 19 October, until Wednesday, 26 October 2016.